Very popular for cross training! Schwinn Airdyne AD8 - a different league! 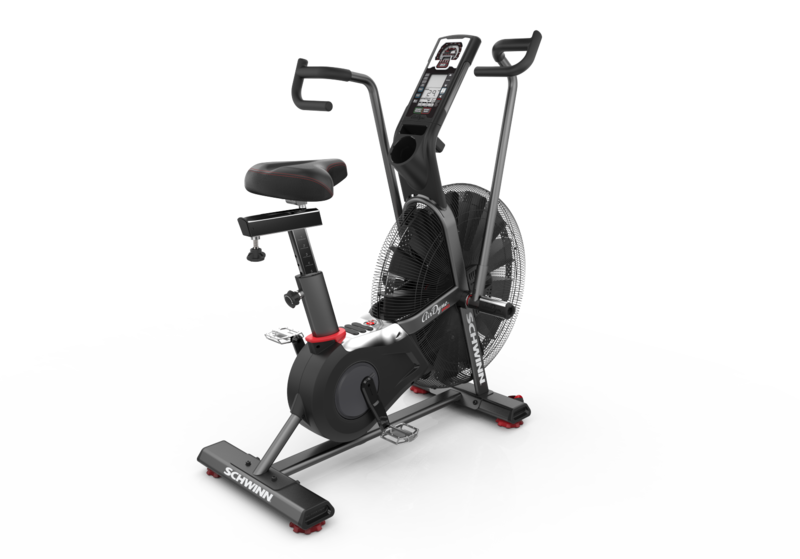 The Schwinn Airdyne AD8 cannot be compared to common exercise bikes, ergometers or elliptical cross trainers. 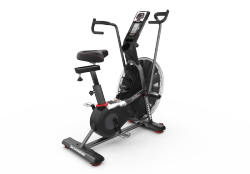 The innovative fitness bike offers an intensive whole body training at a different level. You decide individually how actively you use your body and whether you wish to put more load on the upper or on the lower part of the body. Exercising with the AD8 means: The more intensive you do your movement, the more resistance you will feel. Use different grip options to control your training load and thus your body always faces new training stimuli. The innovative fitness bike of Schwinn works with a wind generator, which produces air resistance. In contrast to electronically adjustable resistance systems, you can define the individual and varying resistance without having to press any buttons on the display. The principle is simple and very effective. The stronger you exercise, the higher the generated air resistance in the drive wheel gets. The very well placed console of the AD8 includes 9 training programs all in all (among which being interval programs, heart rate controlled programs, and a fat burning program). The different interval programs are individually adjustable in training as well as break time: Furthermore you can manually differentiate between aerobic and anaerobic training. An integrated calorie counter gives you a good feedback about your training, you have done, and the burnt calories. It's not only the joint-gentle, soft course of motion but also the ergonomic and individual adjusting possibilities of the saddle which ensure a healthy training. The training beginner as well as the professional athlete can exercise with the Schwinn Airdyne AD8 effectively - test and develop your own performance limit. The stylish fitness bike is also suitable for permanent use at a gym or a private fitness room thanks to its stability. Schwinn AD8 wind screen In stock! Schwinn fitness bike Airdyne AD8 add to comparison list.